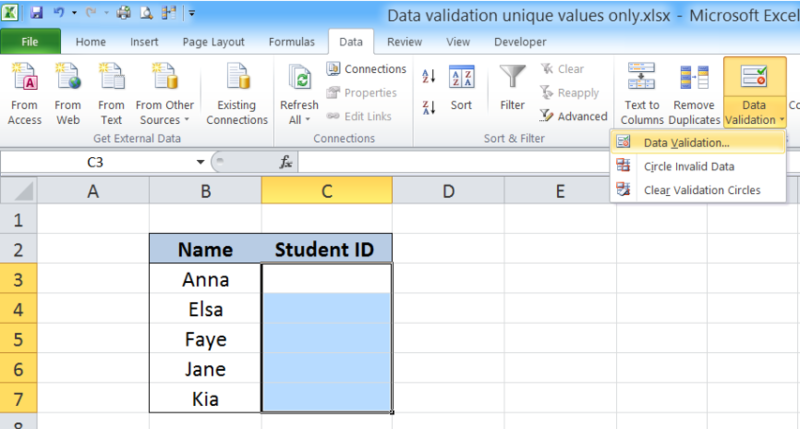 Data Validation is a feature in Microsoft Excel which restricts the values or type of data that users enter into a cell. It automatically checks whether the value entered is allowed based on the specified criteria. This step by step tutorial will assist all levels of Excel users in allowing unique values only. Our table consists of two columns: Name (column B) and Student ID(column C). We want to ensure that a Student ID is unique to each student. 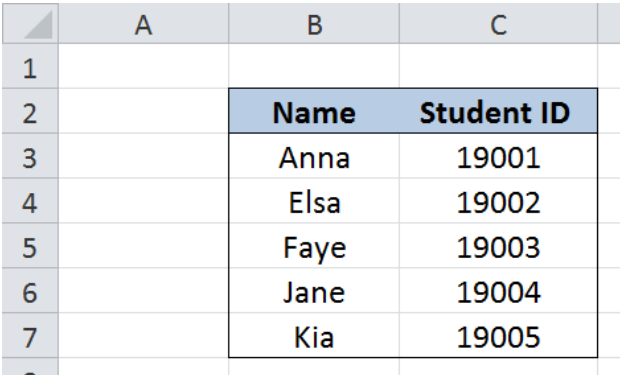 We can restrict the values entered in column C and allow unique values only by applying Data Validation. The dollar signs “$” are necessary to fix specific cells in our formula and enable the validation criteria to work properly for all selected cells. Our COUNTIF function returns the count of the value in C3 within the range C3:C7. Our formula checks if the value entered in C3 does not already exist in the range C3:C7. If the formula returns a count less than “2”, specifically “0” or “1”, Data Validation passes and the value is allowed. 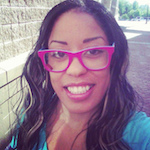 Otherwise, Data Validation fails and the value is restricted. We have now restricted the values in C3:C7 to allow only unique values. Let us try and enter “19001” into cell C3. 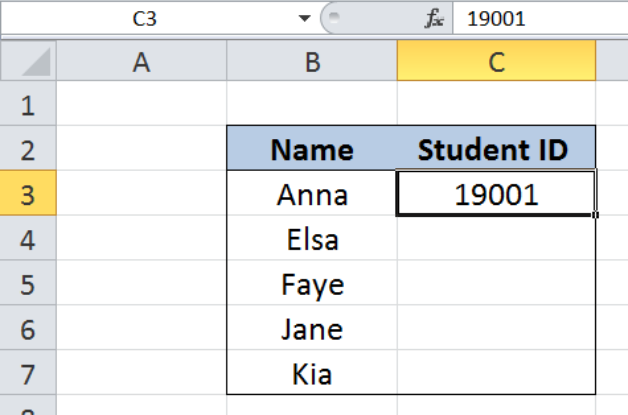 The Student ID “19001” is allowed because it is unique in column C, and no other value is entered yet. Now let’s input “19001” into cell C4. Data Validation is very accurate in allowing only the values as specified in the formula or validation criteria. 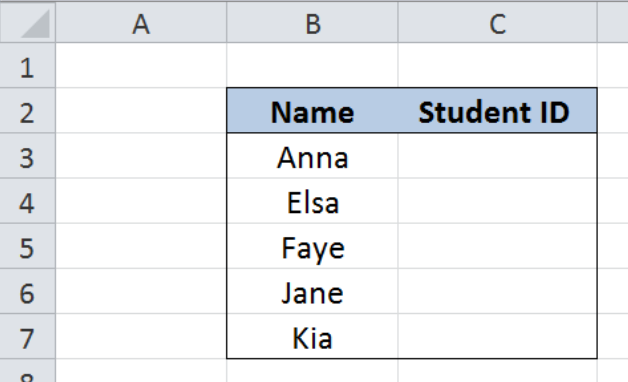 See below table that is filled up with Student IDs unique to each student, as allowed by Data Validation. Having problems with formulas summing values in data validation column. I need assistance in posting only the unique values from a column in another column . I have a list of unique and fist occurance items that I want to make a data validation list with. The list I have has a formula in it that allowed me to make it in the first place and now the data validation list only reads nothing. Do you have a formula I can use to show the items in the list I have? Please help me again, i want to add some other conditions to the unique code data validation.